You’ve been warned: This granola is so easy to make, super satisfying and pretty darn good for you. The only problem with food of this nature is portion control. One can easily nibble a pan away without breaking a sweat (mea culpa). 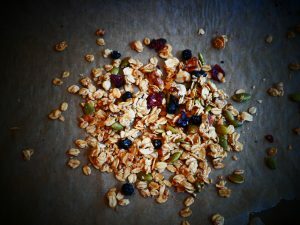 You can make your granola with regular (or better yet organic) oats, or you can start with Muesli. I’ve tried it both ways and gotta say, you really can’t go wrong. A couple notes: you can skip the nuts or seeds to skip calories, but they’re really good for you & delish. I hate to be the bad guy but there are a whole bunch of unhealthy “health foods” out there masquerading as your friends. Granola, which I love dearly, can and usually does contain gobs of fat and sugar. It’s pretty easy to make your own, and when you do you’ll see how there can be so much bad stuff (white sugar, oil) in this should-be-good-stuff. When you make your own, you can control the amount of sweet stuff & use your favorite healthy sweetener such as maple syrup or honey (instead of white sugar) as well as choosing the fat of your choice (chia goop instead of oil). 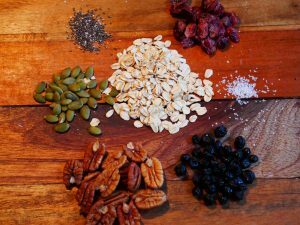 Moreover, you can add all your favorite goodies (nuts, seeds, berries), better still, you can switch ’em up to give it a fresh twist every time you make it. Needless to say, it’s great with yogurt, baked fruit (& yogurt/ice cream/whipped cream) & all by itself. Toast on a lined baking pan at 300 for 25-30 min. Turn off the oven & leave inside until cool.